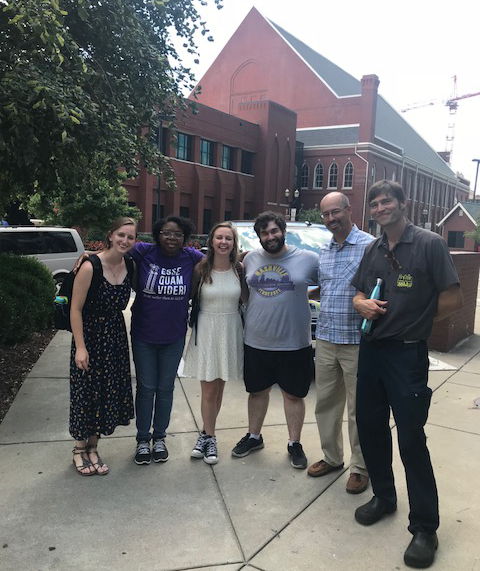 Trevecca welcomed four new faces to campus last week, as the University’s AmeriCorps Volunteers in Service to America (VISTA) members arrived. Trevecca graduate Dani Neiderhiser and Nashville native Ellie Lovell will work with the J.V. Morsch Center for Social Justice, while the Trevecca Urban Farm will host Evan Davis, a graduate of Butler University, and Alexanderia Swain of Greensboro, Ala. The AmeriCorps VISTA program is a national service program that primarily works to eliminate poverty. Since 1965, more than 220,000 VISTA members have served in all 50 states and U.S. Territories. The program is funded by the Corporation for National and Community Service (CNCS), a federal agency. The VISTA members will serve alongside the University for one year, with an option to renew for a second year. Neiderhiser is originally from Madrid, Spain, and studied social justice at Trevecca, graduating in 2015. Ellie Lovell, a graduate of DePaul University in Chicago and a Nashville native, earned a degree in political science. Neiderhiser and Ellie Lovell will work with the Center for Social Justice, helping the University better assess the needs of those living in the neighborhoods that surround the University as well as establishing practices to better track the service efforts of students, faculty, staff and administrators. Davis holds a degree in English and theatre and a minor in Spanish from Butler University in Indianapolis, Ind. Swain has attended both Spelman College and the University of Alabama, studying nursing and public health. These VISTAs will work closely with Jason Adkins, Trevecca’s environmental projects coordinator and director of the urban farm. Their work will focus on community gardening and changing the health status of the 37210 zip code. Janice Lovell, Trevecca’s director of grants and foundation relations, is excited to welcome the team to the University to begin their work. For Davis, who met Adkins when she was in high school and is involved in the Nashville environmental community, participating in the program is a chance to put the principles she’s learned in college into practice. After a week of meetings and orientation, the VISTA members say they’re ready to get to work. “I’m just excited to get to work,” Ellie Lovell said.